The crowd approaching the basilica during the Festa della Salute. The Venetians read with horror the reports of the numbers of people dying every day in Milan. There but for the grace of God. If the plague ever reached Venice, it would be even more devastating since the population lived more cheek-by-jowl than the Milanese and, due to the presence of the lagoon waters, evacuation was almost impossible. In the summer of 1630, the unthinkable happened. A resident of Venice died of plague. Then another, and another, until the city was completely infested. Over the next year, tens of thousands of Venetians would be wiped off the residency rolls as the city lost over 30% of its people. The disease took rich and poor, high and lowly with it. Even Doge Nicolò Contarini, was not spared. It would take until the 1950s for the city to reach a population similar to that before the plague. The Basilica gets very busy on the day of the festival. Contarini and the city’s leaders were helpless. The plague was not only in the capital but in most of the other urban centres of the Most Serene Republic. There was no cure and very little that could be done to stem the spread of disease, other than wait and pray. When the usual prayers to San Rocco didn’t work, the doge and patriarch decided on a new tack: the promise that a great new church would be built to honour the Virgin Mary, long considered Venice’s protector, and an annual procession of the doge and senate to that church would be established. The date of 21 November, the feast of the Presentation of the Virgin, was chosen for the procession. Votive candles on sale for the Festa della Salute. The bargain did the trick. By the end of 1631 Venice was plague free and the foundations laid for the great church that would become one of Venice’s most iconic buildings, the Basilica of Santa Maria della Salute. The Republic of Venice is long gone, but the festival continues every 21 November. In the days leading up to the festival, a pontoon bridge is built over the Grand Canal just near the Gritti Palace Hotel, connecting the sestiere of San Marco with that of Dorsoduro. The original procession of Doge and Senate would have used this bridge to reach the basilica. The pontoon bridge outside the Gritti Palace Hotel. On 21 November rolling masses are held in the basilica from 6am to 8pm, and Venetians visit it to light candles in memory of those that died in the plague, and also loved ones who might be ill. The mass at 10am is celebrated by the Patriarch of Venice himself. The calli behind the basilica are filled with street food stalls, selling sweetmeats for Venetians to enjoy after their visit. Restaurants all over the city serve castradina, a kind of mutton stew with onions and cabbage, which has become the traditional dish of the festival. Hot, fried, fritoe are available only during carnival and during the Festa della Salute. Sweets on sale during the Festa della Salute. The Festa della Salute is one of the most important festivals for Venetians, occurring as it does in what has become pretty much the only quiet month in the city. If you are in Venice this week, it’s a great opportunity to experience a ritual that started more than three-hundred years ago and is still part of the, now faintly, beating heart of the city. Here’s a video that i made at the festival last year. 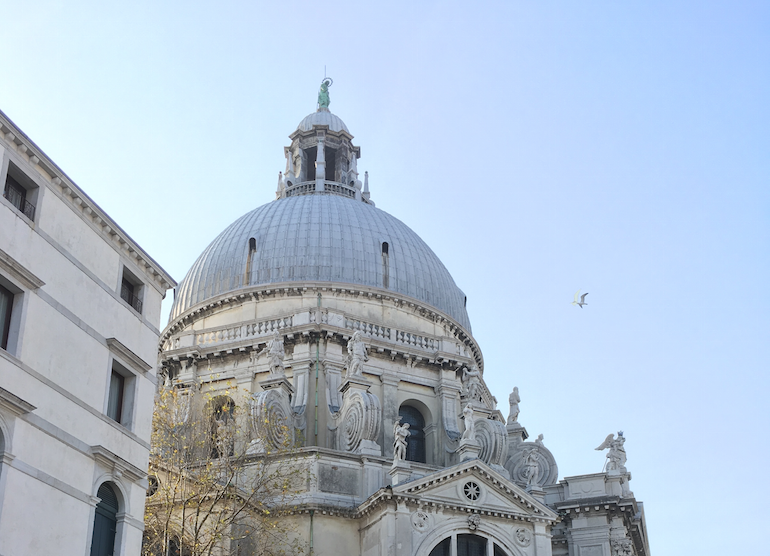 Have you ever experienced the Festa della Salute? I love all the history you entwine in your posts. I have a beautiful memory of staying at The Gritti during my honeymoon. Seeing pictures of it brings back such fond memories, we were there at the same time as the Late Robert Palmer and he serenaded a few of us while there! Were you by chance in a segment on Venice on the show “Somebody Feed Phil”?? I look forward to your posts and one day being back in Venice! What a wonderful place to spend your honeymoon. It sounds like you had a beautiful experience. I was indeed on ‘Somebody Feed Phil’. We had a lovely time drinking and discussing coffee together and I got him to try one the best hot chocolates in Venice. I’m so glad you enjoy my posts.